"I went down in the vaults and saw millions and millions of dollars worth of stuff," Norma Jean Cone wrote in a letter from Tokyo, Japan April 1, 1947. At that time she was the only American woman on a team inventorying the contents of the Bank of Japan vaults right after WWII. Most Americans know very little about the U.S. occupation of Japan after WWII. Also, many 21st Century readers are unaware of how different the world was then in terms of transportation, communications, and life styles. 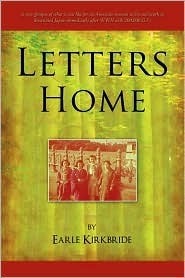 Through Letters Home, the reader gets a personal view of what life was like for a young American woman who was a civilian employee with General Douglas MacArthur's occupying force of 200,000 G.I.'s. At the same time that her team was finding paper bags of diamonds in the vaults, she was learning a little about Japanese culture, sightseeing, attending dances, and developing a deep friendship, which ended tragically. Some of these activities are documented with photos she took. Readers of Letters Home get a glimpse of what things cost in 1947, as well as facts about the occupation of Japan. For example, a telephone call from Tokyo to Los Angeles cost $12 ($120 in 21st Century dollars) for three minutes, if you could get an appointment for a call. But Jean paid only 25 cents per meal, and the hotel room she shared with another American woman cost her six dollars per month including very complete maid services. This book will allow the reader to dive into Norma Jean Cone's life. The reader will learn interesting facts concerning product costs, what life was like after WWII, some Japanese cuter, and facts about Japan's occupation. The reader will have a hard time putting this book down if he/she is even remotely interest in these topics. There is a constant flow of information told in such a way as to keep the reader interested-combining the life of Norma Jean Cone to historical facts and tidbits. Norma Jean Cone was fun to read about. She was certainly likable and the reader can ascertain her intelligence and empathy from her letters. The pictures in this book will serve to enhance the readers' reading and learning experience and further capture his/her interest. The events were fast-paced without being too overwhelming with the amount of information. Any adult reader who enjoys the above topics named will like this book. Appointment setting is nothing but the arranged meeting between client and salesman. It can save your lots of time . Now a days it is so much useful in big companies or firms.